I was looking forward to seeing this wonderful movie which was slated to be aired on TV a couple of weeks back and I had made sure I finished all my chores in time so that I could watch the movie with respite. But then as bad luck would have it, just when the movie started and I settled down to enjoy it, a couple of friends dropped by for a surprise visit. And that blew away any hope of watching the movie. At times like these, I have often wondered about means by which I could record the movie during the time it is aired and then watch it later when I am free. In days of yore, I remember, people used to record the TV programs using a VCR (Video Cassette Recorder) which held at-most 2.5 hours of video. And the result was not guaranteed to be crystal clear. You had to take your chances. Then the computer revolution took place. Now a days, it is possible to watch TV programs on your computer and all it takes is a TV tuner card which you insert into your computer's PCI slot. And some TV tuner cards come with its own remote which makes it as easy to switch channels as in a TV. Of course with the aid of requisite software it is possible to record the programming real time and store them on the hard disk. Microsoft has released a version of Windows called "Windows Media Center Edition" which allows a PC with a TV tuner card to record and playback TV programs. Another very popular device is the "Tivo" service which apart from the above mentioned features also sport additional ones such as accessing internet radio, podcasts, sharing digital photos and more. Basic TV functionality which includes Pause,Fast forward, Rewind live TV. Support for multiple tuner cards and multiple simultaneous recordings. Distributed architecture allowing multiple recording machines and multiple playback machines on the same network, completely transparent to the user. Compress videos using a variety of formats including mpeg4. Automatically detects commercials and skips them. A boon to save disk space when recording movies aired on TV. Grabs program information using xmltv. A fully themeable menu to tie it all together. Picture in picture support, if you have more than one tuner card. Electronic Program Guide that lets you change channels and select programs to record. Program Finder to quickly and easily find the shows you want to record. Browse and resolve recording conflicts. Rip, categorize, play, and visualize MP3/Ogg/FLAC/CD Audio files. An RSS news reader ... and much more. But the one thing which needs to be highlighted is that MythTV software runs on GNU/Linux and Mac OSX and supports both powerPC and Intel architecture. 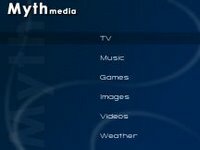 MiniMyth - This is a small Linux distribution which turns a diskless computer into a MythTV front-end. Fedora Myth(TV)ology - This is a project started by Jarod Wilson - an RHCE himself and currently working for Red Hat, this is his endeavour to make running MythTV as seamless and easy as possible in Red Hat based Linux distributions. This site has lots of information about the types of TV related hardware supported by Fedora as well as numerous tips, tricks and solutions which he stumbled upon while trying to install and configure MythTV on his Fedora Linux machine. Ed Tittel and Justin Korelc have written a very good article which gives more details about MythTV which makes an interesting read. Hi, I live in the UK and use the budget PCI card for this purpose, along with Ubuntu (these cards are great - don't be put off by the word budget - all it means is they pull the MPEG2 multiplex straight off DVB-T signals and that's it - but that's perfect for Myth anyway). MythTV really is top class. If anyone wants any help setting it up then please get in touch - I currently have a headless always-on unit, an Xbox front-end (plugged into the telly) and my laptop (XP or Linux-based frontends) for watching in bed, etc. If anyone wants any help esp if they are in the UK and using DVB (Freeview) then get in touch with me - ewwsimpson at google's mail service, gmail.com. As I reference on my site, http://www.dragonfyre13.com, my personal favorite, and perhaps the easiest to setup and configure is MythDora. It's a distro like Knoppmyth, without all the bugs and issues. It's based on Fedora (yech!) but it's a good solid distro. The new release is now integrated with MythTV and gives it a gyro-controlled UI that lets you navigate long lists of media and the TV's EPG by waving, like a Wii, for fast, smooth control. Also wave to scan through your media and adjust volume and lights. There's a new demo walkthrough video on Google Video, and also available in high-def at linuxmce.org. Installation is 25 minutes and every step is shown starting with a clean PC.